A bride plans every single detail of the biggest day of her life and a lot of it revolves around her outfit. The bridal lehenga can transform your day from everyday to wedding day and that’s why it’s so important to get it right. We have brought you a few brides who have created and crafted the perfect bridal look for themselves with their bridal lehengas. It’s good to see that the bridal world has stopped revolving around the color red. When used creatively, it can work wonders. 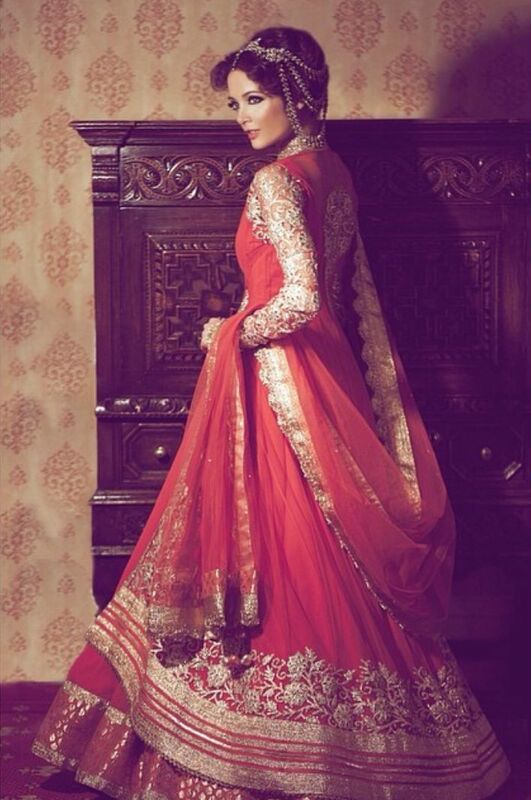 In most cases these days, red can make your lehenga look like any other bride’s. What’s so different about these reds, you ask? They are used gorgeously, so much so that you will never forget the lehenga or the bride. Whether it is a long lace sleeve, with a larger than life ghagra or complementary colors, these brides have chosen the red lehenga that’s as distinct and as beautiful as themselves. Pairing with blue seems to be an overwhelming choice for brides wearing red lehengas. An ethereal, deep blue choli paired with a red and orange ghagra make for a bride who is traditional but willing to experiment at the same time. The hemline design on the dupatta or the front of the ghagra, this blue makes for a great choice for an evening or late night wedding. It’s not too bright, but the heavy gold work creates a princess like effect. Some brides are willing to sway from the usual red, to colors that suit them better and are perfect for making a bridal fashion statement. My favorite is Soha’s gold lehenga-sari, with the burnt orange drape on her head. Nothing is more regal than the color gold, and Soha wears it with grace and elegance that’s rarely ever seen before. While it is not so bling that it hurts the eye, it attracts attention and keeps it there. Other brides are seen in peaches and pinks – the colors of the season. If you have the body type for it, there’s nothing more stunning than a pink or a peach lehenga. The work on the lehenga is heavy and bridal enough to leave no doubt in the minds of the guests as to who the bride is, while the outfit is so classy and different, that the little girls will be making notes for their big day. The cut and flow of the lehenga is entirely dependent on your body type. You can choose a longer, corset choli to hide any bulges, or simply opt for a high waist ghagra. Most brides prefer sleeves on their wedding days, and why not? Even a small cap sleeve can go a long way in making your arms look shapely and slimmer in photos. Not to appear too demure, you can opt to be a little daring with your neckline and your back. Whatever we may do on other days, our wedding day has to be the day when we look our best. This comes from awareness. So learn what colors, cuts and drapes suit your skin tone, body type and wedding theme to create a lehenga that’s a concoction of perfection.